Business strategies and organization are subject to a permanent adjustment due to the discontinuity of the markets. Mass production, in particular, and a focus on tayloristic principles, in general, no longer seem to be the right choice within this context. Rather, the increasing importance of customization and the transition to an information-based economy leads to the question whether the currently enshrined distinction between producer and consumer is still appropriate. The authors of this paper assume that the key to dealing with complex economic turbulences can be found in the implementation of a new form of coordination, in which the strict separation between producer and consumer is repealed. That requires changeability at all levels of production systems as it is inherent to the approach of “Open Production” that will be introduced with this paper. 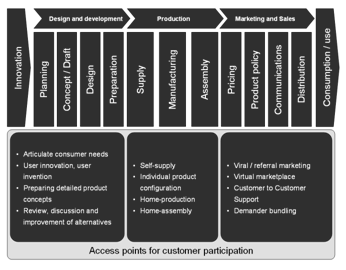 While Open Production encompasses recent concepts like „Open Innovation“, „Mass Customization“, and “e-Manufacturing”, the three “pillars” of Open Production are openness, individualization and web integration. Additionally it implies a superior broker system that coordinates the information and material flows between the stakeholders of open production. This represents a completely new, but profoundly changeable form of coordination integrating the customers into production directly, where as the previously static separation into a customer and a corporate domain and the division of labor and competence is dissolved.